Bhandaria Upazila (Pirojpur district) area 163.56 sq km, located in between 22°22’ and 23°33’ north latitudes and in between 89°54’ and 90°08’ east longitudes. It is bounded by Rajapur and Kawkhali (Pirojpur) upazilas on the north, Mathbaria upazila on the south, Kanthalia (Jhalokati) and Rajapur upazilas on the east, Pirojpur Sadar upazila on the west. Population Total 155256; male 79081, female 76175; Muslim 139971, Hindu 15226, Christian 32 and others 23. Water bodies Main rivers: Baleswari, Kacha, Pona, Nalbunia; Chaechri-Rampur Beel (Padma Baor) is also notable. 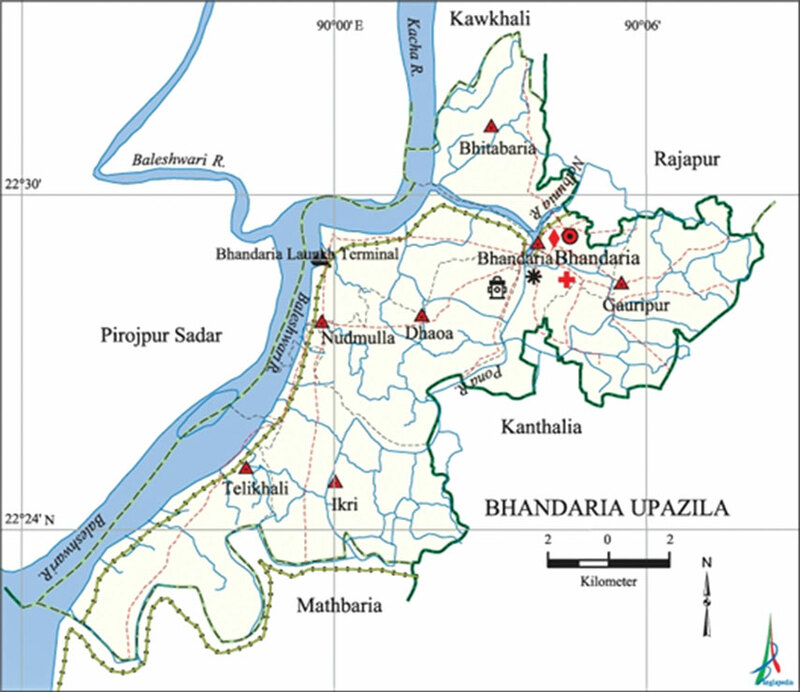 Administration Bhandaria Thana was formed in 1912 and it was turned into an upazila on 15th April 1983. Archaeological heritage and relics Dighi (tank) and twin Mosque (also known as Shia Mosque) of Bhelai Chowkider, Thakur Madan Mohan Mandir, Mazars of the martyrs of peasant rebellion (Singkhali). Historical events Peasant rebellion was held in 1854 at Singkhali of this upazila. Peasant leaders Gagan and Mohan Miah revolted against the British rule and the local zamindars in which 17 rebels were killed. The freedom fighters attacked the Bhandaria police station in August 1971 under Subedar Aziz Shikder in which a number of rajakars were killed. The Pak army retreated from Bhandaria upazila after they sacked the Bhandaria Bandar on 29 November. Marks of the War of Liberation Memorial monument 1 (Shargabani). Religious institutions Mosque 660, temple 172. Noted religious institutions: Twin Mosque of Bhelai Chokdar, Bhandaria Jami Mosque, Ikri Jami Mosque, Tagore Madan Mohan Mandir. Literacy rate and educational institutions Average literacy 62.7%; Male 63.8%, female 61.5%. Educational institutions: college 5, technical college 1, secondary school 41, primary school 124, madrasa 81, orphanage 3. Noted educational institutions: Bhandaria Govt. College, Majida Begum Girls College, Amanullah Higher Secondary School, Bhandaria Bihari Lal High School (1913), Bara Kanua A Majid High School (1927), Tofazzal Hossain Manik Mia High School, Bhandaria Thana High School, Ikri High School. Newspapers and periodicals Weekly: Bhandaria Barta (1998), Mukhur Bangla (2001). Cultural organisations Club 32, library 8, literary organisation 1, Shilpakala Academy 1. Main sources of income Agriculture 49.82%, non-agricultural labourer 5.30%, industry 0.58%, commerce 16.44%, transport and communication 2.95%, service 11.20%, construction 1.97%, religious service’ 0.35%, rent and remittance 1.46% and others 9.93%. Ownership of agricultural land Landowner 70.05%, landless 29.95%; agricultural landowner: urban’ 61.30% and rural 71.49%. Main crops Paddy, betel leaf, chilli, sugarcane. Extinct or nearly extinct crops Sesame, linseed, arahar, china. Main fruits Mango, coconut, betel nut, guava, banana, Chalta, amra. Communication facilities Pucca road 46 km, semi-pucca road 33 km, mud road 350 km; waterways 39 nautical miles. Extinct or nearly extinct traditional transport Palanquin. Noted manufactories rice mill, saw mill, ice factory, printing press, brickfield, welding factory. Cottage industries Blacksmith, potteries, shital pati, wood work, bamboo work, cane work. Hats, bazars and fairs hats and bazars are 18, fairs 4, most noted of which are Bhandaria and Ikri bazars and Dashhara, Baishakhi and Patlakhali melas. Main exports Guava, banana, amra, betel nut, coconut, Shital Pati. Access to electricity all the unions of the upazila are under rural electrification net-work. However 26.58% of the dwelling households have access to electricity. Sources of drinking water Tube-well 67.78%, pond 27.86%, tap 0.37% and others 4.00%. The presence of arsenic has been detected in shallow tube-well water of this upazila. Sanitation 39.77% (rural 34.73% and urban 70.23%) of dwelling households of the upazila use sanitary latrines and 57.16% (rural 61.17% and urban 26.89%) of dwelling households use non-sanitary latrines; 3.07% of households do not have latrine facilities. Natural disasters as a coastal region this upazila was affected by tidal bore and cyclone for many times. Besides, the cyclones of 1941, 1961, 1970, 1977, 1986, 1988 and 1998 caused huge loss of life and damage to settlements, crops, livestock and other properties of the upazila. NGO activities BRAC, Caritas, ASA, CARE.